Paying for an incomplete game has been a controversial topic for many months since the first early access release on Valve's Steam back in March of last year. Titles such as Dayz, Rust, and The Forest are only some of the successful titles that are undergoing the early stages of alpha. Early access is a great way for the developers to gain money in order to provide a better service for the game. It also allows the consumer to provide feedback to the developer into guiding the game to the correct path. Along with great features of purchasing an early access game, there are many risks such as scamming coming from the developer or simply a bad title with little effort to update the game. Head developer of DayZ, Dean Hall was interviewed last month by Eurogamer about the topic with DayZ and next-gen consoles stating "We've toyed around what to do with the console side of things...We have to get the core aspects of the game finished before we commit to doing anything. Otherwise you make a big announcement and then you wait for six or 12 months.” With Hall's answer, many have hinted that the online survival game will close to its final product before the end of 2014. No news has been heard of from Microsoft and their Xbox One, which should be a neat exclusive to the PS4 community. In another recent interview by Sony's Adam Boyes, has talked about the consideration of an early access program similar to Steam where developers can sell their games before the game is finished. Boyes has also talked about the risk that consumers will have to take if they want to participate in the program, "That’s one of the massive conversations we have internally -- that, at what point does [a game meet standards of release]? We still at some point ensure that we're being mindful of the consumer. We don't want somebody to stumble across that title and expect a full product, and have a negative experience." Boyes came across a good point that caught my attention as some players will not have the patience to go with a uncompleted game that risks having little to no progress in the future. 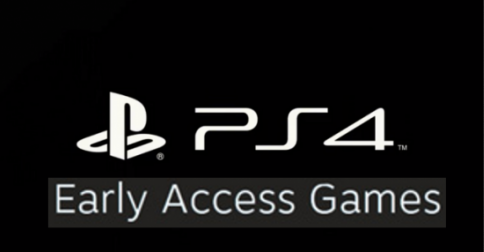 The early access program does sound like a wonderful idea, and I think it will be one of the greatest features the PS4 has to offer since no news has been heard from Microsoft currently offering something similar. The program like stated before possesses a lot of risky activity as some games could be cancelled before their official release. Steam doesn't allow refunds to consumers for cancelled games which would also be interesting to see if Sony should follow the same steps as Steam. What do you guys think about the program? Should the early access program be implemented for the PS4 or should no changes be made and wait for full releases?